After the success of my first Turner skirt I made a second this time I added pockets. To recap Turner is a dress pattern by Cashmerette. It is a really nice dress that I am yet to make, Turner skirts are just the skirt portion of the pattern. On Cashmerette’s blog you can find a free pocket pattern that you can insert in the seams of the Turner dress. 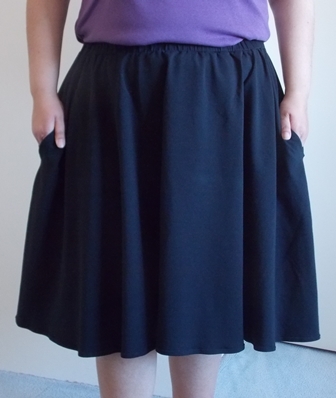 I needed a black skirt in my wardrobe so I ordered some unbrushed cotton knit from Pitt Trading and made my first skirt with pockets. I initially made the skirt but before I had even hemmed it I wasn’t happy with the pockets, they sat too low. I forgot that in the pattern the skirt joins the bodice very high on the waist but if you are only making the skirt portion you don’t have the waistline sitting as high when you wear it. When I added the pockets they ended up sitting closer to my knees. I reduced the width of the waistband when I made this version and was bit drunken sailor with my stitching on the overlocker so when I unpicked the waistband I didn’t have as much wiggle room to reattach the waistband. I cut a new waistband from some leftover fabric however this time I left the elastic joined in a loop and just sandwiched it between. I attached it using the overlocker. Once I took it off the machine and stretch it I heard the unfortunate popping sound as some stitches busted. I redid them on my regular sewing machine using the overlock stitch. I am not sure if it the fabric which doesn’t have the same drape as cotton lycra does or if it is the fact that there are pockets in the side seams but this does seem a little bulky or boxy. It doesn’t look odd I just know it isn’t as flat on the hips. Maybe I need to go down a size, there would still be plenty of room in it if I did. If I made another one I would again move the pockets even higher. They are nice size pockets, I can easily fit my phone and keys in them and know they aren’t going to fall out. When I wear my Lego skirt now I keep reaching for the pockets. Initially when I made this skirt I was going to wear it to an event and I put so much effort into finishing this skirt even after every set back. I never get really emotional about an item but this skirt I just had to finish. It sounds silly but I was emotionally exhausted after making this skirt. I was reminded why I don’t put too much emotion into my sewing, I like it but I don’t attach that much feeling to it. I wore the skirt a heap of time before finding out unfortunately what I made it for wasn’t going to happen and suddenly I didn’t know if I wanted to wear this skirt anymore. It sat for about a week before I picked it up to wear it again and finally asked Mr StitchNSew to do photographs for me. 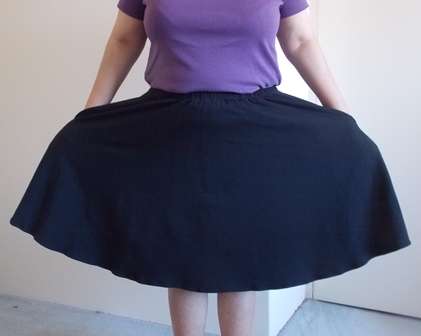 I had sort of nicknamed this skirt but I am not doing that now it is just now known as my black turner skirt. I will continue wearing it because it is a functional skirt with pockets. Last week halfway through getting dressed one morning I remembered I would be needing pockets due to something I was going to do that day which would tie up my only free hand so I changed skirts so I could have pockets.